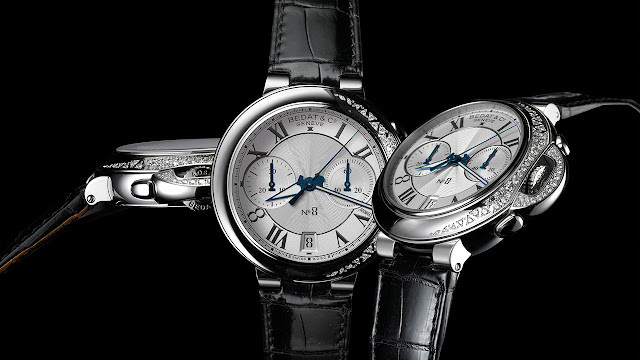 The new Référence 830.030.100 from Bedat & Co is the epitome of classical elegance and femininity. Its first lady's chronograph, this timepiece beautifully captures the company's values of horological mastery and artistic virtuosity. Its design is particularly attractive, with its opaline and guilloché dial, black Roman numerals including the brand's signature 8 symbolising prosperity and good fortune, thirty-minute counter and small seconds. The case is equally stunning. The polished steel bezel is set with diamonds, like stardust, that spill onto the crown cover. 52 stones in all bring opulent sparkle to this creation whose contemporary style elevates the measuring of short time, and which lends itself just as easily to casual wear as to special occasions.